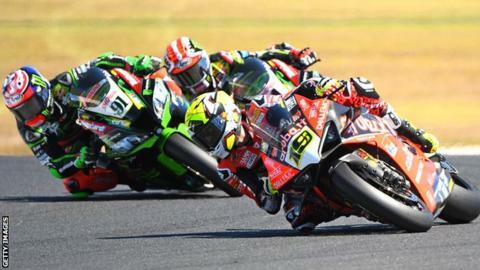 World Superbike newcomer Alvaro Bautista secured a hat-trick of wins at the opening round of this year's series at Phillip Island as champion Jonathan Rea finished second in each race. Bautista, 34, followed up his maiden success on Saturday by winning the newly-introduced 10-lap Superpole sprint race and race two on Sunday. The Spaniard is only the second rider in history to win his opening races. The Ducati rider boasts a maximum 62 points with Rea second on 49. Bautistawon Saturday's race oneby 15 secondsand led from start to finish in the second main race of the weekend to secure victory by a margin of 12 seconds. Rea, 32, saw off Kawasaki team-mate Leon Haslam in the battle for second, with Yamaha-mounted trio Michael van der Mark, Alex Lowes and race one podium finisher Marco Melandri completing the top six. American John Kocinski was the only previous rider to emerge from his first World Superbike weekend with a 100% points tally back in 1996. Welshman Chaz Davies finished seventh, but still 26.823 seconds behind his new Aruba Ducati team-mate Bautista. Eugene Laverty was ninth, Leon Camier 10th and Tom Sykes 13th. Northern Irishman Rea was beginning his bid for a record fifth straight World Superbike title. In the day's earlier all-new Superpole race Bautista took the chequered flag by 1.176 seconds from Rea after a race-long battle. Haslam came home thirdin a race which saw points awarded for the top nine riders - from 12 points to one - but does not count for statistics. The new race also gave these top nine riders their final grid positions for race three, based on their Superpole race finishing positions. Laverty took a point for coming in ninth.